Besides a new look and feel this ‘Converged User Interface’ is also rebranded to Outlook on the Web or OOTW. In my opinion the use of Office Web Apps in Exchange Server 2013 to view attachments in a browser window was a bit messy. This has improved in Exchange Server 2016 as well. There will also be a new version of Office Web Apps server which will be called Office Online Server 2016 but this is not part of this public beta. Two other new features I’d like to mention are the URL Preview (in OWA and Outlook 2016) and the Insert Inline Images (in OWA). The URL Preview is a security measure, when you intern a URL in an email message, a preview is shown in the message. This makes it possible for the recipient to have a quick look at the webpage before clicking the actual link. The Insert Inline Images feature in OWA makes it possible to add images directly in the body of the email message instead of adding the image as an attachment. When it comes to Outlook client support…. Outlook 2016 is fully supported, and so are Outlook 2013 and Outlook 2010, providing these are fully patched. Outlook 2007 is no longer supported with Exchange Server 2016. There’s also a lot of integration with OneDrive in Exchange Server 2016. This makes it possible to send email messages with (very) large attachments, where the attachments are stored in OneDrive instead of attached to the email message. For this to work properly you need SharePoint 2016 on-premises, or an Office 365 OneDrive with an Exchange Hybrid Configuration. The cool thing is that this new feature not only works in Outlook Web Apps, but also in Outlook 2016. There are some architectural changes in Exchange Server 2016 as well. If you are aware of the Exchange 2013 Preferred Architecture you know that Microsoft recommends to use a multi-role server where the Client Access server role and the Mailbox server role are combined in one server. In Exchange 2016 the Client Access server role no longer exists as a separate server role but is now integrated in the Mailbox server. One server is more efficient (Client Access to Mailbox server ratio is always 1:1), consumes less resources and is less complex to install and configure. So Exchange Server 2016 now only has two roles: the Mailbox server role and the Edge Transport server role. The consequence of this architectural change is that when using a DAG with multiple Exchange 2016 server you can no longer use Windows NLB as a load balancer solution. If you want to use load balancing in multiple Exchange 2016 server with a DAG you have to use a (hardware) load balancer. If you have an Exchange 2013 hybrid environment with an ADFS single sign-on solution you are most likely aware that single sign-on does not work for Outlook clients and user are still prompted for username and password. The technology needed for single sign-on is simply not available in Outlook 2013. 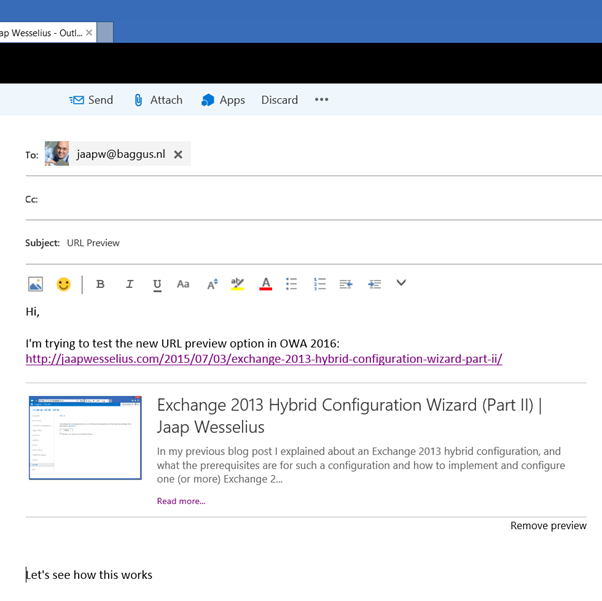 Exchange 2016 and Outlook 2016 now support what’s called the Modern Authentication, making is possible to have a seamless single sign-on solution for Outlook clients. Modern authentication will also be available in Outlook 2013 and is currently (July 2015) available in Public Preview. More information can be found on the article Office 2013 modern authentication public preview announced. Microsoft introduced the new MapiHttp protocol in Exchange 2013 SP1 as a successor of the old Outlook Anywhere (RPC over HTTP) protocol. MapiHttp has been deployed in Office 365 as the default protocol, and Exchange 2016 will use MapiHttp as its default protocol. Another good feature is that MapiHttp can be enabled/disabled on a per user basis. 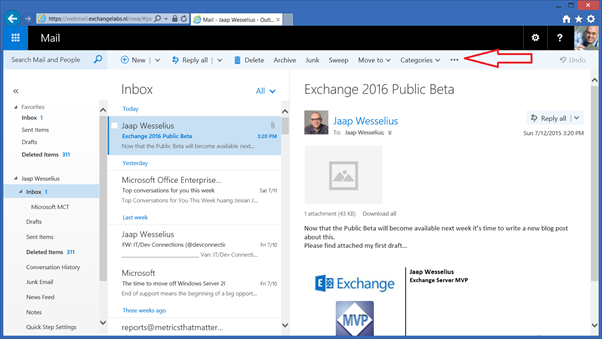 I have to mention Windows 10 here as one might expect support for Windows 10 in this new version of Exchange server. Unfortunately Windows 10 is not supported for this Public Preview and there’s not a word yet about Windows 10 support when Exchange 2016 is released later this year. At this point Exchange 2016 is supported to run on Windows 2012 and Windows 2012 R2. When it comes to Active Directory, the minimum Forest Functional Level and Domain Functional Level has been set to Windows Server 2008. Please note that in earlier communications from Microsoft his was set to Windows Server 2008 R2, but after serious customer feedback this requirement was lowered to Windows Server 2008. Coexistence with Exchange 2013 is the best solution I’ve ever seen with Exchange server. The Client Access service (this is not the Client Access server role!) in Exchange 2016 is fully compatible with Exchange 2013. Clients accessing Exchange 2013 Client Access are fully proxied to an Exchange 2016 Mailbox server so this makes your upgrading life much easier. Even better, you can add Exchange 2016 servers to an array of Exchange 2013 Client Access servers in a load balancer and it just keeps working, independent of the location of the actual Mailbox (Exchange 2013 or Exchange 2016). Figure 4. 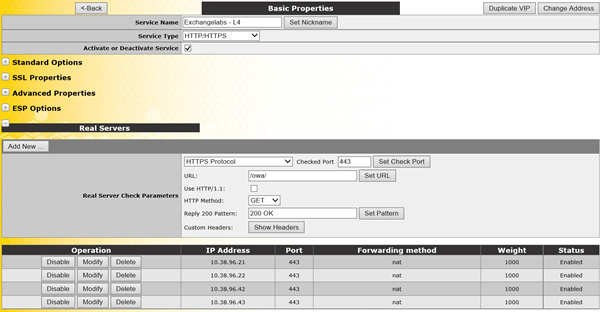 Two Exchange 2013 servers (.21 and .22) and Two Exchange 2016 servers (.42 and .43) in the same VIP on the Load Balancer. Coexistence with Exchange 2010 is similar to the coexistence between Exchange 2010/2013 so no real new developments here. Note. Coexistence with Exchange 2013 is really easy, but you have to be aware you cannot upgrade an existing Exchange 2013 server to Exchange 2016 like you can with a Cumulative Update. You have to build a new server with Exchange 2016 and move all resources to this new server. Also, if you have a DAG in Exchange 2013 you cannot add Exchange 2016 server to this existing DAG. You have to build a new Exchange 2016 DAG and move all resources from the old Exchange 2013 DAG to the new DAG. This is important to remember, although this will become more important when Exchange 2016 RTM is released. You shouldn’t be surprised to see a strong integration with Office 365. Over time Exchange Online will be moved to Exchange 2016 as well, and whether you like it or not, The Cloud (i.e. Office 365) is the future. I see smaller customers move to Office 365, but a lot of customers are moving to a Hybrid Solution between Exchange online and Exchange on-premises. There will be one combined Compliance Center that deals with Exchange 2016 on-premises as well as Exchange Online, independent of the user’s Mailbox location. eDiscovery for example can be used from this compliance center, and Mailboxes in both locations can be discovered. In Exchange Online there’s a (new) feature called Groups, which actually reside in Azure Active Directory and (a Mailbox) in Exchange Online. When using an Exchange 2016 Hybrid scenario these Groups are synchronized to the local Active Directory and appear as a Distribution Group in Exchange 2016. 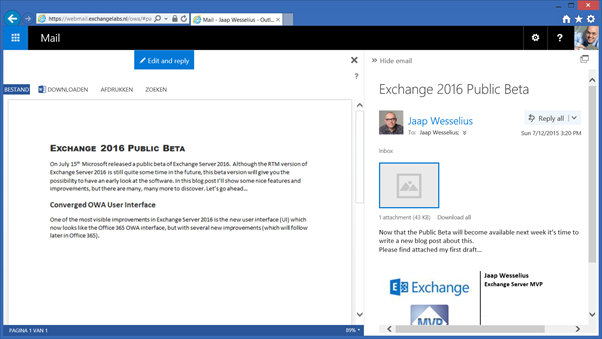 In this blog post I mentioned a few new features of Exchange 2016 that was released as a Public Review recently. These new features certainly makes it worth to have a good look at the product, and start planning on when to upgrade to this new version after RTM (late this year). There are a lot more features that will be in Exchange 2016, just to name a few: lowered disk I/O for Mailbox databases (again), Calendar search, larger storage devices, improved App integration, Public Folder hold, larger Mailboxes etc. More information will gradually become available when we are getting closer to the release of Exchange 2016 RTM. One important remark: this is a public preview, and is not to be used in production environment. Only if you are a member of the TAP (Technology Adoption Program) you can deploy this in production and still be fully supported by Microsoft.